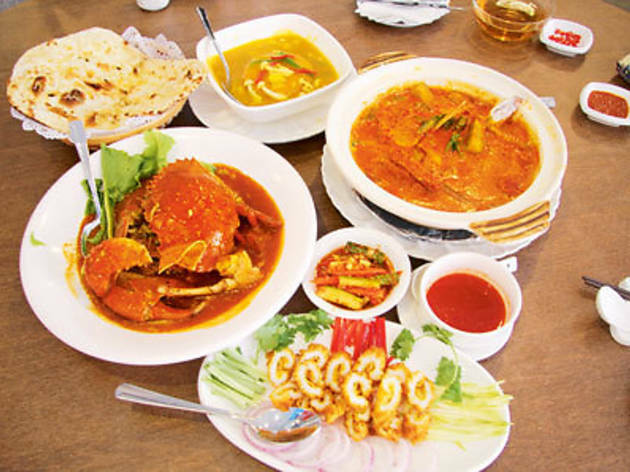 Will Singaporeans travel to Little India for seafood or, for that matter, Chinese food? The owners behind The Mask – who also own Nalan’s Pure Vegetarian restaurant – are banking on it. And, as if to hedge their bets, they’ve fashioned a restaurant with a two-man kitchen, with one Chinese and one Indian chef running the show. Mask’s decor is Chinese seafood restaurant-meets-air-conditioned zhi char stall, where tanks of live seafood are punctuated with paintings of the eponymous Chinese mask. Not exactly an outstanding interior. The menu? It’s a quirky and eclectic mish-mash of Chinese- and Indian-accented seafood, with a sprinkling of fusion fare. You may, for instance, sample live tiger prawns prepared in typical Chinese style – poached, steamed with minced garlic or ‘drunken’ in Chinese wine; or in Indian fashion with a thin coat of tongue-searing masala paste. One of the dishes being brewed up in the melting pot was the steamed fish head – drenched in a thick and fiery-red kadai masala paste choked with tomatoes and ginger slices. While this bold fusion dish may sound exciting, it wasn’t. The fish was properly steamed, but the spice paste was so dense that it did not penetrate the flesh. Disappointment continued with the scanty slices of meat used to make the butter chicken, doused in a thick and creamy sauce, which left an unpleasant, sour aftertaste. Even the prawn biryani, which greeted us with a fragrant note, was oily and served with overcooked prawns. The Chinese fare, in comparison, sparkled several notches above its Indian counterpart. Our chilli crabs arrived in gargantuan chunks, drenched in subtly sweet and sour gravy that was perfect for wiping with our order of plain naan. The voluptuous hunks of luscious crab meat were comparable in quality to that of the pricier Sri Lanka variety. For $28 per order (about 800g to 1kg of meat), this dish is going down in our books as the best value-for-money crab in Singapore. Equally good were the battered cuttlefish, deep-fried to a perfect crisp and served in a sweet and tart Thai sauce; and the deceptively simple but intensely savoury kang kong that was pan-fried with fish sauce and minced garlic.